Carlofo wireless charger speaker - The speaker that never fails to deliver crisp, robust sound. This 2*10 watts system produces rich and immersive sound quality that you can enjoy at the comfort of your home or even outdoors. phone always by your side wireless charging is available，just put your iPhone X on the area.Also，USB port can charge your devices conveniently.SO，forget about the lack of electricity. sing with the music The speaker can connect a microphone, so you can also go with music to show your voice. Two Becomes One The speaker supports stereo pairing for added acoustic depth,So you can create an enveloping sound field.Superb quality surround sound experience can be made by simply pairing two of our speakers together. The saying that two will always be better than one。 Connect Effortlessly Included auxiliary input helps your device to connect effortlessly. Pair this speaker with virtually any Bluetooth-enabled device with ease.In addition, it's the best gift idea for your loved ones, due to its wireless Bluetooth connectivity and exclusive design! At Carlofo- we pride ourselves on providing the highest quality products and service. Our speakers are tailor-made with customer's need in mind and aimed for perfection. Carlofo is driven by our core values of creating products that exceeds current standard and strive for continuous improvements that go beyond expectations. 2X10W Powerful Sound,Stereo Pairing Function:Advanced digital sound,noise/wind reduction technology,and unique loudspeaker cavity structure to deliver premium acoustic sound,crystal clear balanced bass, surround sound after pairing. Bluetooth fast transmission and AUX function： It is compatible with android, IOS and windows systems, almost support your phone, computer and any other bluetooth available devices. 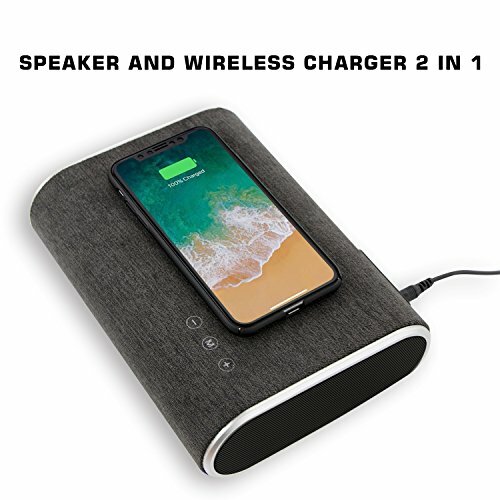 Phone charging： wireless charging is available，just put your iPhone X on the area.Also，USB port can charge your devices conveniently.SO，forget about the lack of electricity. The microphone：The speaker can connect a microphone, so you can also go with music to show your voice. If you have any questions about this product by Carlofo, contact us by completing and submitting the form below. If you are looking for a specif part number, please include it with your message.